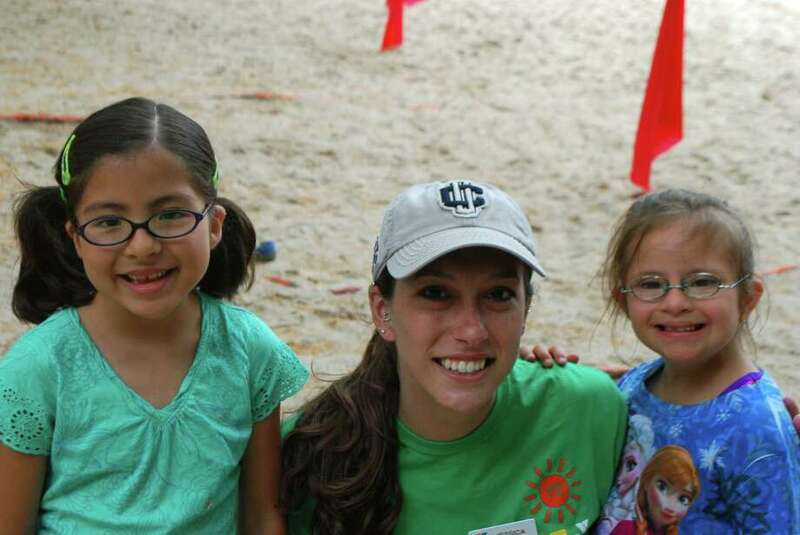 Emma Chavez and Grace Lombardo, shown with camp counselor Jessica Milsom, are two of 32 children with special needs who are participating in New Canaan YMCAís Camp Y-Ki this summer. As summer progresses, anyone who stops by the New Canaan YMCA or Kiwanis Park will witness the sounds and sights of summer camp fun, including swimming, crafts, games, wacky costumes, songs, and so much more. Embodying the Y culture of providing a place where everyone feels welcome, the Y offers multiple options for children with special needs to enjoy a summer camp experience. This summer, more than 32 kids with special needs are participating in the Y's traditional programs, including Camp Mini, Sports Camp and Camp Y-Ki. An additional 15 participants are involved in a camp designed specifically for teens with special needs. Campers in the inclusive program join other campers in traditional activities. "Our inclusive summer camp program is truly an amazing program," said Carolynn Kaufman, the Y's director of special needs programming. "Each year, we watch our participants with special needs not only have fun, but also grow at camp, building both independence and self-confidence that they carry with them into the next school year. Our typical campers fully embrace this inclusive environment, building character and social skills, as well. It is so inspiring to watch our campers with special needs and typical campers play together during the summer and then high-five each other at the Y during the rest of the year." In order to create the environment, all Y camp counselors participated in a workshop with Liat Karsch, SLP of HEIGHTS Social Communication, prior to the start of camp. The workshop taught counselors strategies for promoting an inclusive and welcoming environment for all of their campers and the range of social abilities that are present in children. For information, contact Kaufman at 203-966-4528, ext. 162.